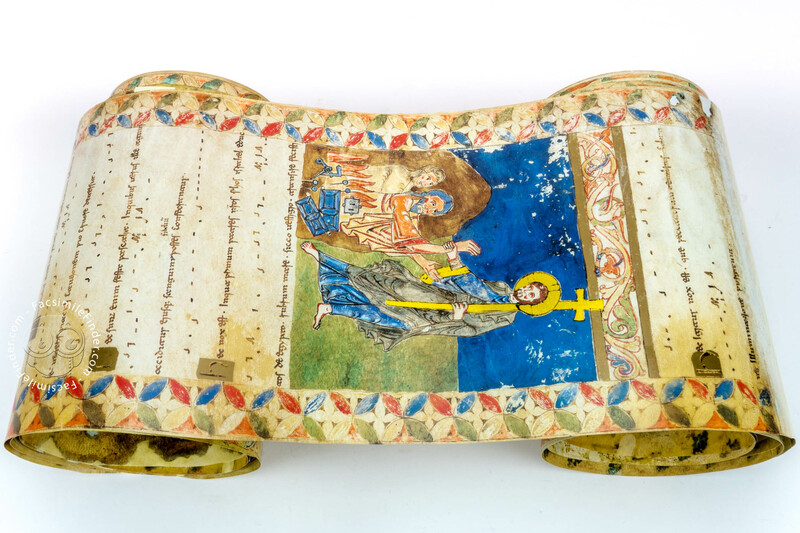 The Casanatense Roll is justly considered one of the most interesting Romanesque liturgical rolls from Southern Italy, in the Montecassino area. 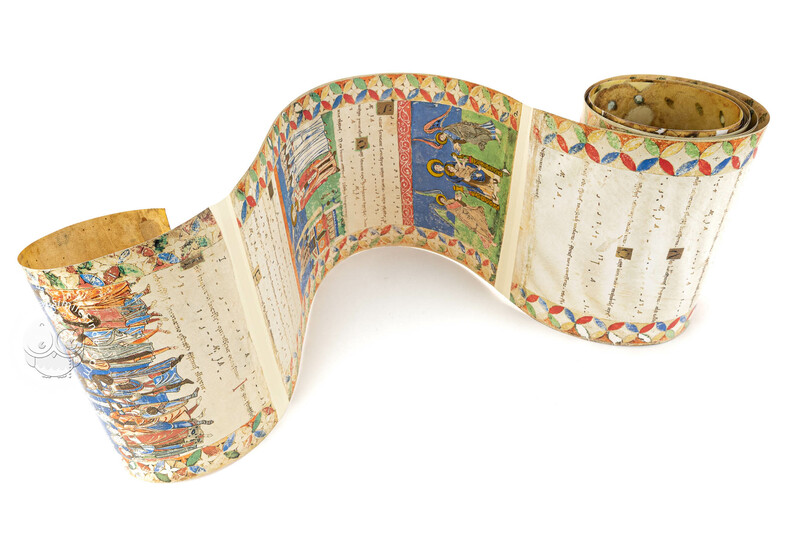 The document, also known as Exultet Scroll, was written and illuminated in the 12th century. 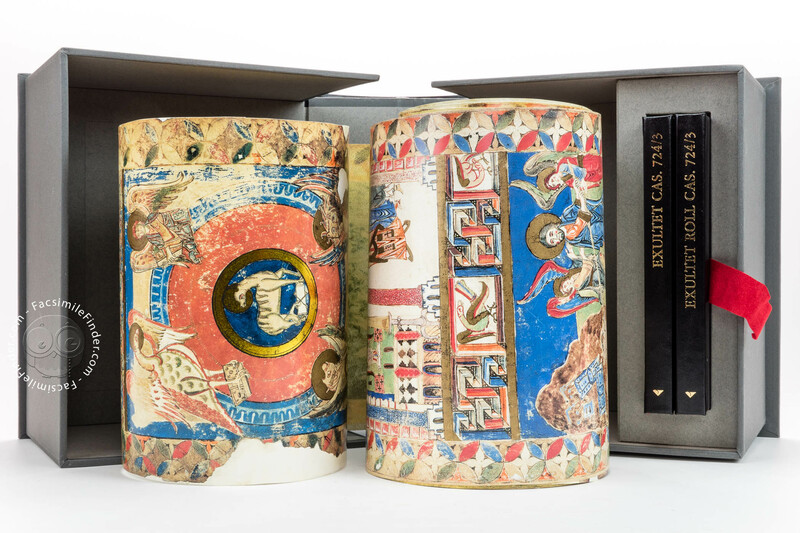 The Exultet Roll is named after a chant sung on Easter eve – when the Paschal candle is lighted and consecrated – and whose opening words are Exultet iam angelica turba caelorum. 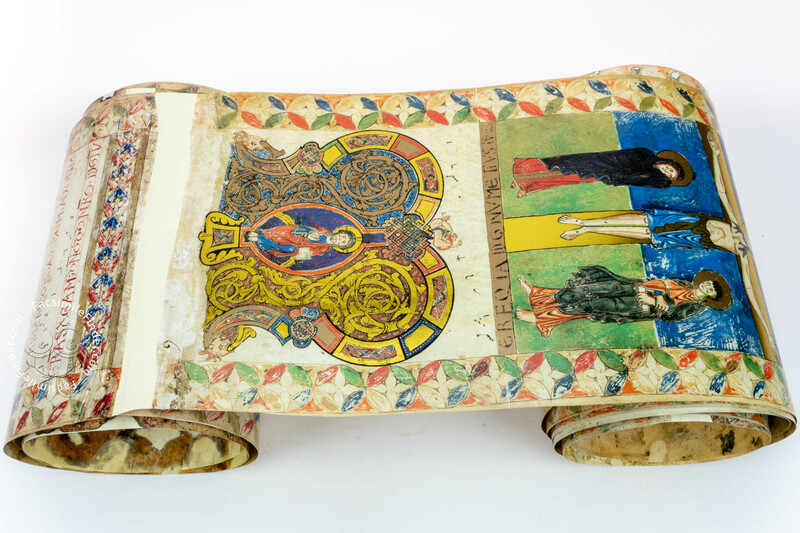 The Casanatense Roll, like other scrolls of this type from the Beneventan area, is accompanied by illustrations that step by step represent the different stages of the rite in order to be of more easy comprehension to the faithful. 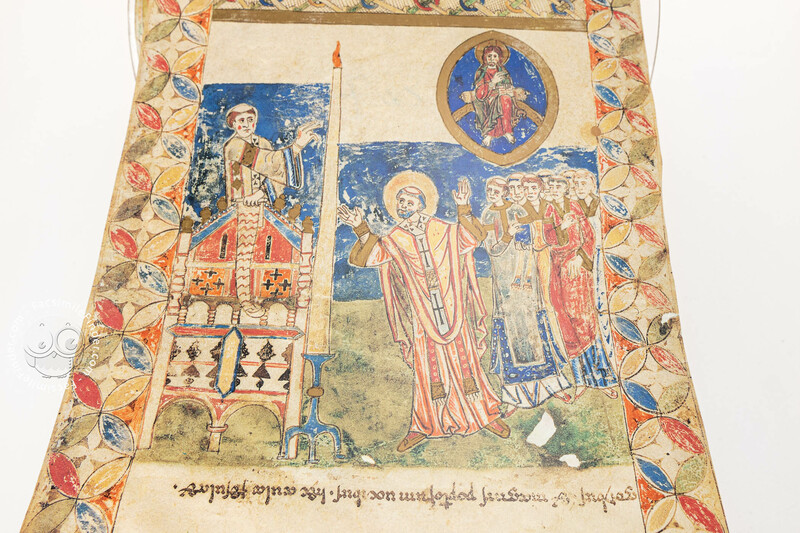 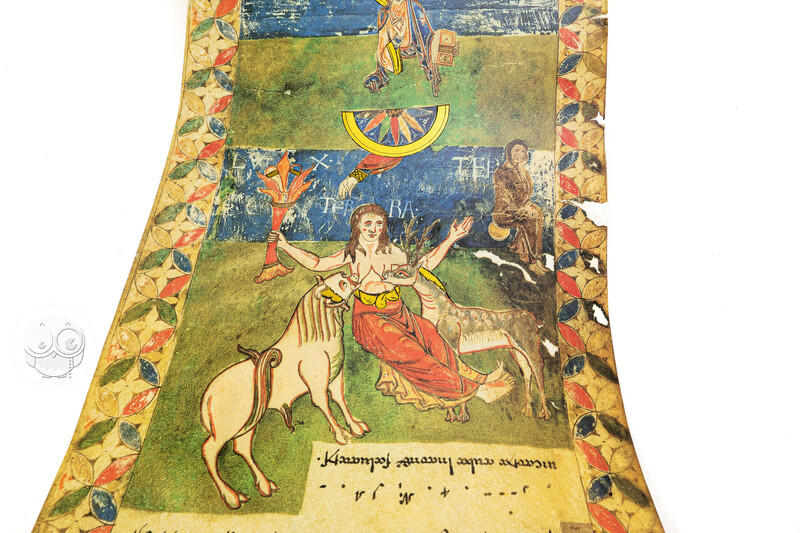 In order to make the rite more accessible, the illuminations were placed upside down so that as the deacon unfolded the roll letting it fall from the ambon, the worshippers would see the images right side up. 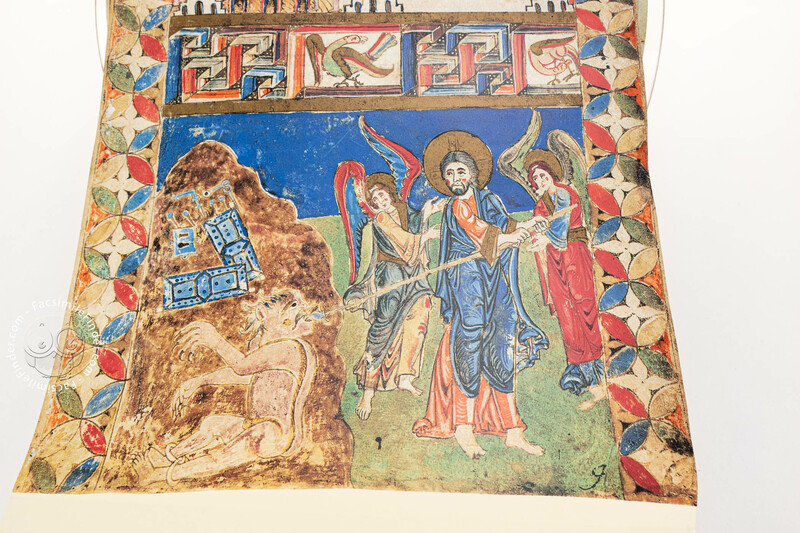 Some of the scenes featuring in the outstanding iconographic apparatus are the parting of the red sea and the Crucifixion from the Old and New Testament. 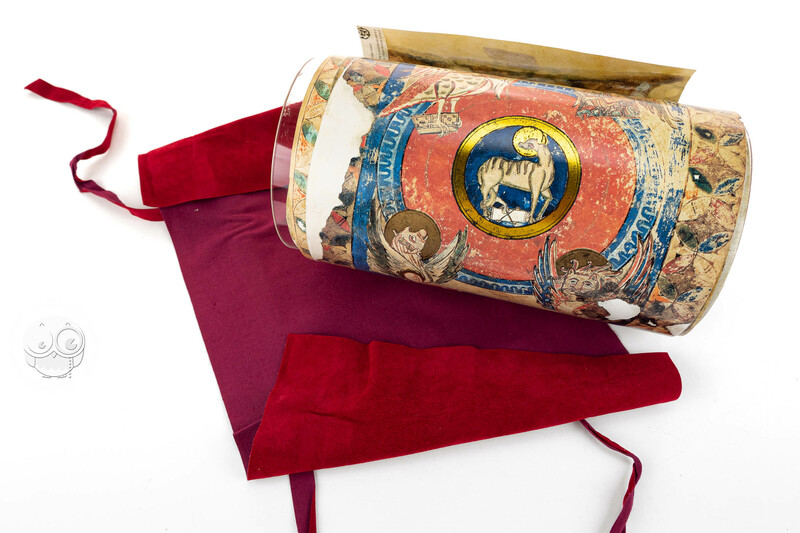 It is worth noticing the lavishness of the color scheme which, featuring vivid shades of red and blue, was intended to catch the eye and impress the viewers. 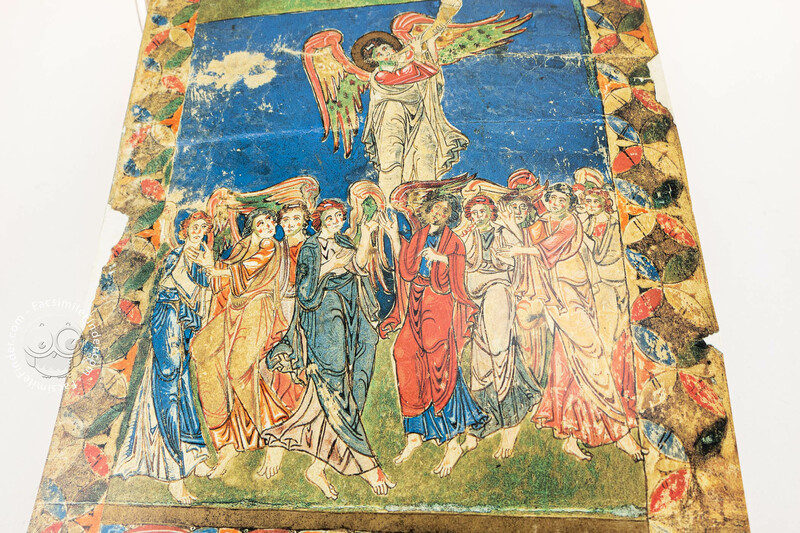 Although Italian Romanesque art did not reach the same standards as the Anglo-Saxon school, it did, however, represent the strong connection between South Italy and the Byzantine Empire, whose art is echoed by the scriptorium of Montecassino. The life of the Exultet Scroll is accounted for from the late 17th century when Cardinal Girolamo Casanate (1620-1700) created his great collections of manuscripts, some inherited some purchased, which included the liturgical rolls of the Pontifical and the Benedictional of Landolfo I, and scroll Exultet which has been safely treasured, and still is, in the Biblioteca Casanatense (the manuscript is named after it), in Rome for the last 3 centuries. 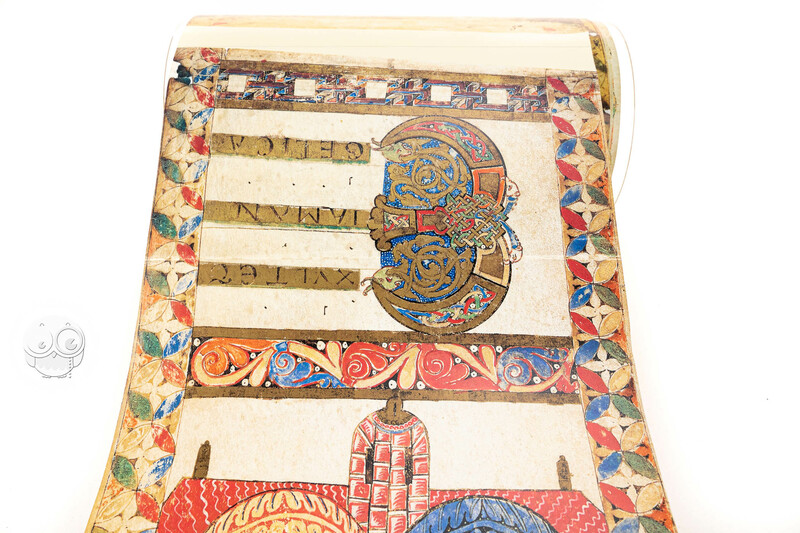 The Exultet scroll features a beautiful example of Beneventan minuscule, also known as littera minuscula Beneventana, which was developed around the 8th century in southern Italy having as its most important production scriptorium the Abbey of Montecassino. 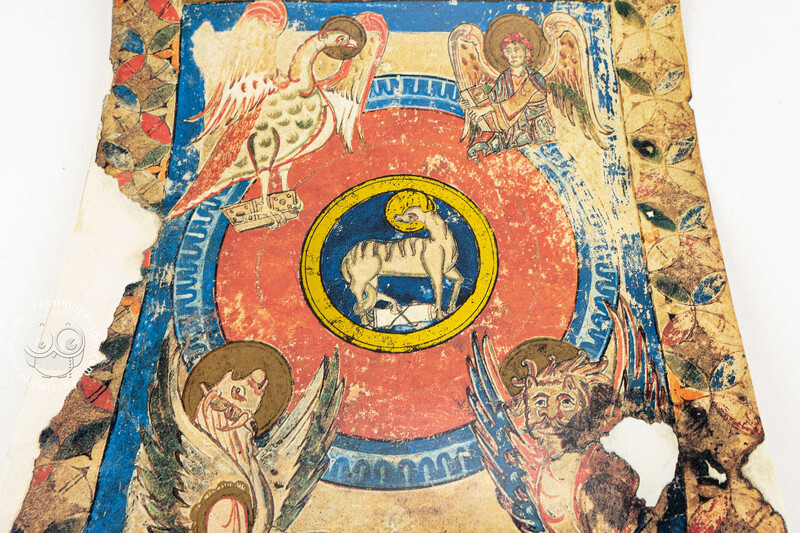 Some of its main features are the letter a with a hooked form, ligatures and connecting strokes involving the pendent letter i, and the use of several abbreviations. 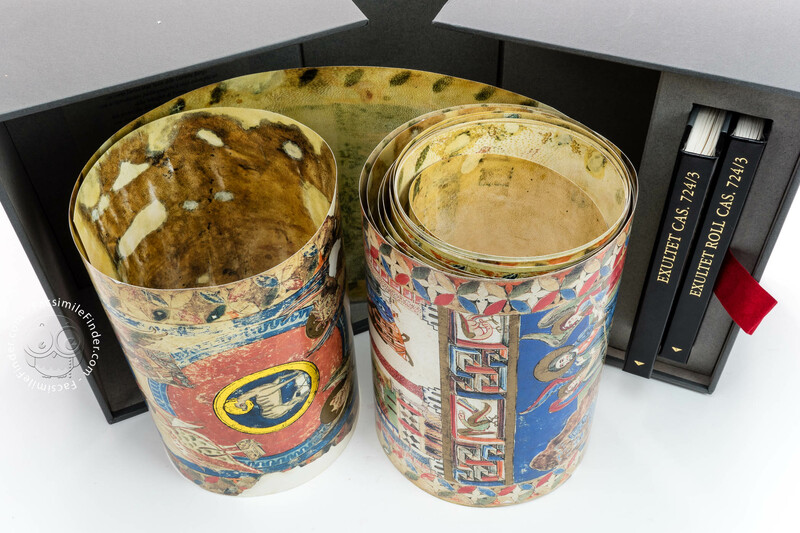 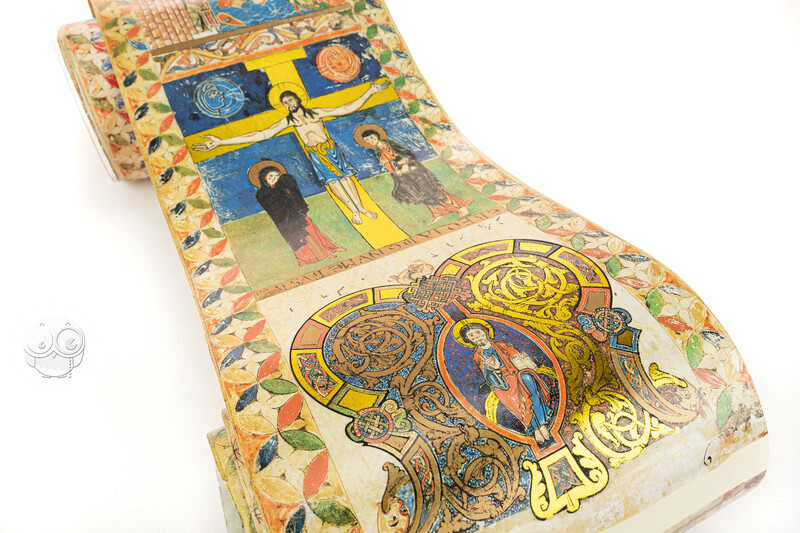 Unlike typical manuscripts the Casanatense Roll does not feature an actual binding but it has come down to us gathered together with other liturgical rolls in the original, oblong calf-bound registers. 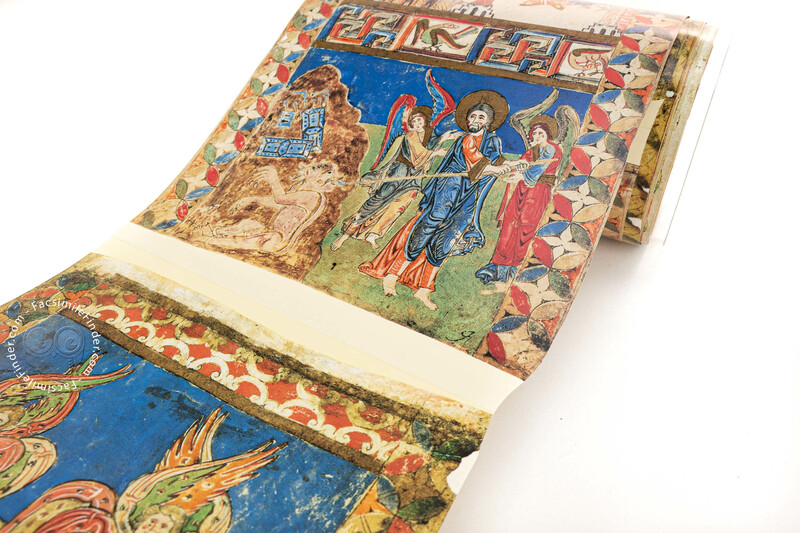 Full-size color reproduction of the entire original document, Scroll Exultet: the facsimile attempts to replicate the look-and-feel and physical features of the original document; pages are trimmed according to the original format; the binding might not be consistent with the current document binding. 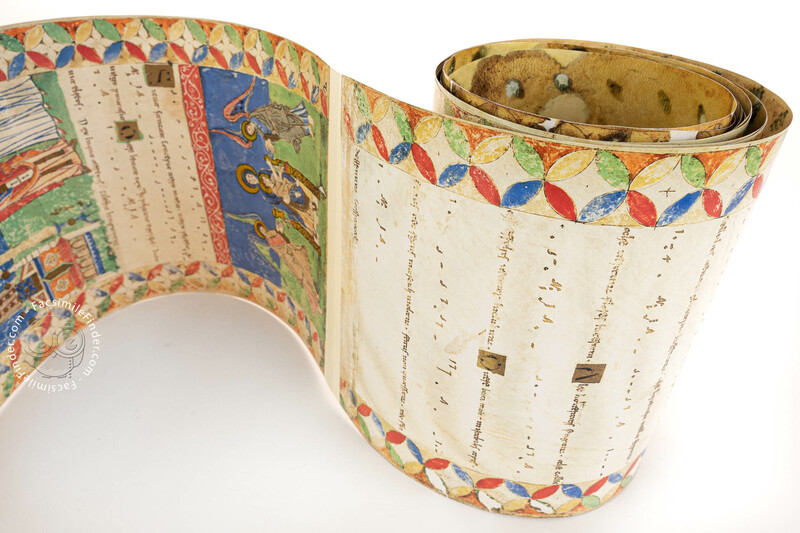 In order to render the original structure of the scroll, the individual sections (reproduced in authentic facsimile reprint on parchment-like art paper especially manufactured by the mill in nine colours plus gilding, and with all the original flaws and fraying) have been reassembled like the original, and the rolled-up scroll comes in an elegant slipcase that also contains the commentary volume.